Last week, I did a five day juice cleanse as an “out with the old, in with the new” for my eating habits. As a yogi, I’m keenly aware that the quality of what I put in my body is a direct representation of the quality of my overall health. Seasonal juicing is a way for me to set my sights exclusively on my health for a week. Over the course of five days, I drank a variety of fruit and vegetable juices, typically with a berry mix juice for breakfast, kale/spinach for lunch, a carrot or beet sweet vegetable juice for a mid-afternoon snack, and another fully vegetable juice for dinner. By drinking juices, my body’s cells gets a straight shot of vitamins, minerals, micro-nutrients, antioxidants and calories while giving my digestive system a rest. While one fortuitous by-product of the cleanse is a little weight loss, the best part is just feeling aware, and, well…clean. Cleansing makes my skin bright, makes my hair less greasy, makes me feel “digestive-ly” balanced, helps me sleep well, and makes me acutely aware of my eating pitfalls. It shows me how little food we need to get by and still feel normal, as well as indicating what situations and foods make me want to eat things that I shouldn’t. You’ll hear some people say that cleansing is a hokey thing, a Hollywood thing, or a junk science practice, but for me, it’s something that makes a difference in my health. 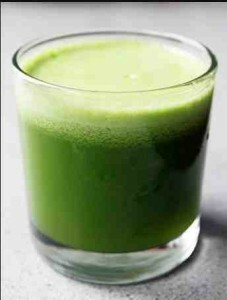 And if you want to try my delicious lunch juice recipe, go with this one below. It helps to have a juicer for this, but if you want to make it into a smoothie, just add a cup of water and substitute apples with a banana!